Start every day being super clear what ONEthing you must do today really really well. Buyers in Texas have a right to representation; Realtors in Texas have a legal and ethical obligation to inform you of your right to representation. Last month I had the honor of listening to David Tandy, CEO of Gracy Title, talk about the Austin economy, the Austin real estate market outlook and where we’re going. Hold on … the Austin we know today will not be the Austin of 2023. Some of the numbers I will reference in this post include articles, posts & research from the Austin Business Journal, 2013-2014 Angelos Angelou Economic Forecast, and the Austin Chamber. My biggest takeaway was that the Austin growth, momentum, economic outlook numbers are quite possibly understated. The main premise here is that most of the economic forecast, growth projection numbers were researched and posted PRIOR to the F1 Circuit of Americas airing in November (which had an estimated $483M economic impact to Austin) where 600 million people worldwide heard about Austin, TX and what an amazing city we are. Austin is no longer a secret. At a 2.9% growth rate, we are the fastest growing city in the US. In 2013, there will be 60-70,000 people moving to Austin. This growth will continue. For every 2.5 people, we need one housing unit (home or apartment) which equals a 28,000 demand this year. This demand will continue. In 2012, we created about 12,000 housing units, demand was 28,000; we currently have a 30,000 housing deficit. This deficit will continue. Californians are moving to Texas, a lot of them. Recent headlines involve Governor Perry’s poaching tour of CA (real classy move, Gov). California’s tall state income tax, increasing sales taxes and suffering schools are fueling the 3rd coast migration. Besides #sxsw, watch for more CA license plates in TX. The growth in Austin over the next 3-10 years is going to be huge, dare I say explosive. Jobs are fine … best job growth in the country. We will continue to feel it with housing supply, multiple offers, increasing prices, affordability and traffic. Buyers have to be very strategic and on-the-ball with making an offer. The demand & low supply is pushing prices up. There is a ton of CASH out there right now. Gracy Title says 30% of their closings right now are all cash. This translates to disadvantage for contingent and low down-payment offers. Connect with your favorite savvy and qualified Realtor to customize your real estate strategy and successfully navigate Austin as we know it today. © Julie Nelson and The Nelson Project at Keller Williams Realty, 2013-2015. Unauthorized use and/or duplication of this material without express and written permission from this blog’s author and/or owner is strictly prohibited. Excerpts and links may be used, provided that full and clear credit is given to Julie Nelson and The Nelson Project at Keller Williams Realty with appropriate and specific direction to the original content. Julie Nelson is a licensed Realtor with Keller Williams Realty in Austin, TX. This article and other blog postings should not be construed as legal or professional advice. Contact your favorite Austin real estate professionals in person for actual advice. Julie can be reached at www.thenelsonproject.com. Searching for homes? We think this is the coolest Austin home search tool available. So your payment on a $250k house today would be the same as your payment on a $150k house in 1992. 600 people reached the top of Mt. Everest in 2012. This blog got about 7,100 views in 2012. If every person who reached the top of Mt. Everest viewed this blog, it would have taken 12 years to get that many views. 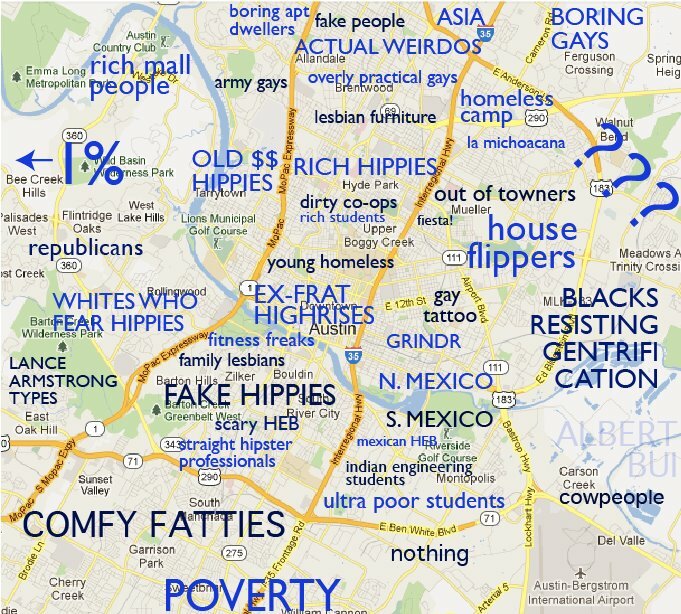 I spent an hour on the Google this afternoon looking for the best maps of Austin. Austin neighborhoods, Austin area schools, Austin demographics, Austin politics, etc. Holy cow, it’s the mother lode! I found the City of Austin maps library! The mother lode of Austin maps. How about median family income? We’ll stop there. Call us if you want in-person conversation, interpretation, input or opinion on any of this. Julie Nelson is a licensed Realtor with Keller Williams Realty in Austin, TX. This map link list and most of her blog postings should not be construed as legal or professional advice. Contact your favorite Austin relocation professionals in person for actual advice. Julie can be reached at www.thenelsonproject.com. Searching for homes? We think this is the coolest Austin home search tool available. © Julie Nelson and The Nelson Project at Keller Williams Reatly, 2016-2020. Unauthorized use and/or duplication of this material without express and written permission from this blog’s author and/or owner is strictly prohibited. Excerpts and links may be used, provided that full and clear credit is given to Julie Nelson and The Nelson Project at Keller Williams Realty with appropriate and specific direction to the original content.